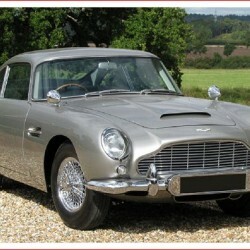 Ever wanted to have your very own iconic James Bond Aston Martin DB5? Well now you can. UK based Aston Martin specialists RS Williams have now put the James Bond Aston Martin DB5 on the market for £3million – describing it as ‘the most famous car in the world’. This particular car never appeared on the big screen but was one of two cars used for promotional purposes – touring the USA in 1965 for the release of Thunderball. It is regarded as one of the four ‘legitimate’ James Bond Aston Martin DB5 cars – and was one of two to have all the gadgets fitted at the time it was built. The main car used in Goldfinger and Thunderball films mysteriously vanishing from a Florida aircraft hangar in the 1990s – making this model the only remaining DB5 with original gadgets. In 2010 the other car used in Goldfinger sold for £2.9 million at RM Auctions’ Battersea sale – although all of the car’s gadgets were retrofitted following the film series’ success. Rarity: One of only four in the world built for the Goldfinger and Thunderball films. One of two to be kitted out with gadgets at the time of being built. Click Here to visit the RS Williams website to see more on the James Bond Aston Martin DB5.